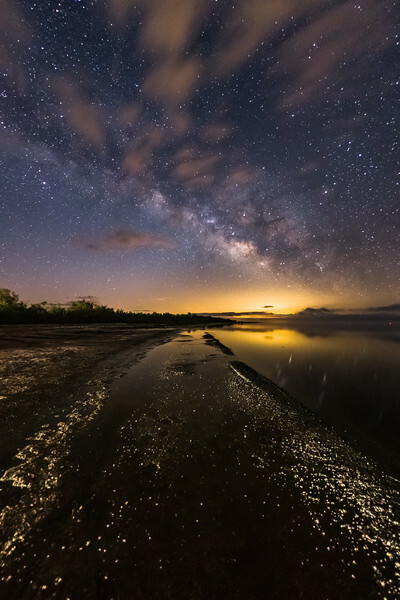 Very early season Milky Way rises over the Salton Sea at Desert Beach along the North Shore. I've been camping at Desert Beach since Sunday evening. After midnight on Monday morning it became far to cloudy to see much of anything in the sky - let alone the Milky Way. So, I decided to spend an extra night and hope for the best. Well, not only did it get cloudy Monday night, it even poured rain for a while. The hourly forecast called for a chance of partly cloudy skies early Tuesday morning, though. I hoped that I'd be lucky and the clouds - to the southeast, at least - would open up sometime between 4:00 AM and 5:00 AM so that I could shoot the galaxy before the light from the rising sun got in the way. Well, there were clouds everywhere and it seemed hopeless until around 4:40 AM things cleared up enough to the southeast that I could see the Milky Way with my own eyes. I did some test shots and couldn't believe how awesome things looked straight from the camera without any processing. I continued to shoot until about 5:07 AM when the light form the rising sun started to wash things out. I shot this at 4:51 AM PST with my Canon 6D and Sigma 15mm at 25 sec f/2.8 ISO 4000. The water even slowed down a bit to make for some decent reflections.